Trust the Twins. . .Meet The Twins. . .the Minnesota Twins. . .Congratulations, it’s Twins. . .it’s a tough existence when you’re greeted with twins. Whether you enjoy shopping at Twin Liquors or want to watch baseball in Minneapolis/St. Paul, OR you’re the parent(s) of twins, the thought of something doubled or ‘twice as nice’ can be a bit overwhelming! Brian has cousins that are twins. . .Pat and Paul Renaud are two awesome guys from an amazing family–different as the day is long, but talk about having each other’s back! We lost Paul not that long ago, and it brought back a flood of memories with he, Pat, Roy and a LOT of cousins. We still laugh-to this day-about the Knights of Columbus bowling tournament in the St. Louis area when we were living there–Palm Sunday–(well, Saturday night)–they brought their own Priest who said Mass in the hotel. . .while the ice was melting in the bath tub as it cooled the beer!! Yep, that was a ‘life moment’ . . . tough to beat the sound of melting ice surrounded by beer cans–or was it the sound of beer cans surrounded by melting ice? Tonight we decided to go south for our wine of choice. Aurelio Montes is a Chilean wine maker who doesn’t stop ‘at the border’. 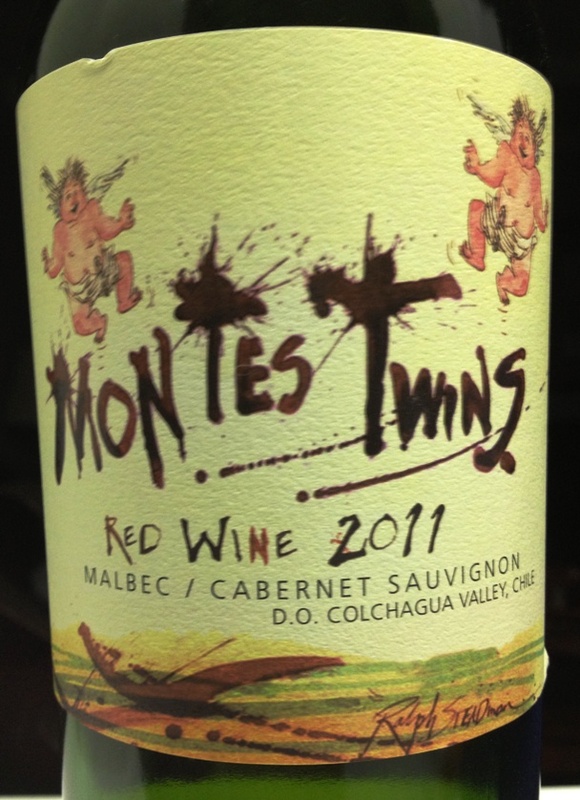 Mr. Montes believes that great wine starts with great fruit, and this wine has an amazing amount of good fruit! On their own, Malbec and Cabernet Sauvignon shine, but when paired up, these two classic varieties complement each other perfectly. It’s a sensational double bill: wonderful richness, structure and fruit from the Cabernet, with smooth, velvety texture from the Malbec—adding up to a wine that’s greater than the sum of its parts while the oak aging contributes with subtle notes of vanilla and liqueur and its soft tannins provide an specially elegant finish. It’s a 50/50 combination that just begs to ask the question. . .if varieties of grapes can get along for centuries, why can’t these? This is a nice wine, but we wouldn’t go ‘hog wild’ in recommending it to others. It’s a bit rough on the nose; the palate has hints of goodness, but still falls short. The finish; however, it will sneak up on you and help you to appreciate a good ‘sunset wine’. Family. It’s one of the ties that bind. We live in a society that doesn’t appreciate or recognize family as the core of building society. We live in a society that is tainted by a media only interested in the almighty dollar. So, we stop–in the aftermath– of senseless tragedy–to recognize and love our family. The building blocks of the future are on their shoulders and WE are the foundation for them. . .it’s really unfortunate that media is allowed to ‘rule our world’, but we LET it. In The Aftermath, please remember to enjoy your favorite wine responsibly and recycle whenever possible. Categories: Uncategorized | Tags: Aurelio Montes, Boston Marathon, Geodid tools, Knights of Columbus Bowling Tournament, Malbec/Cabernet Sauvignon, Missouri, Montes Twins, St. Louis | Permalink.